We hope everyone had a fantastic 4th of July. A reminder that we do not meet this Saturday but the following – July 14th. We’ll start as usual at 10:00 (quick picks). Come early if you’ve questions for Tooch. Starting at 10:30 we’ll have a visit from Jim D’Ville. He’ll be giving his Play Ukulele by Ear Workshop. Jim D’Ville is a music educator and facilitator who is on a mission to get ukulele players off the paper and playing music by ear. 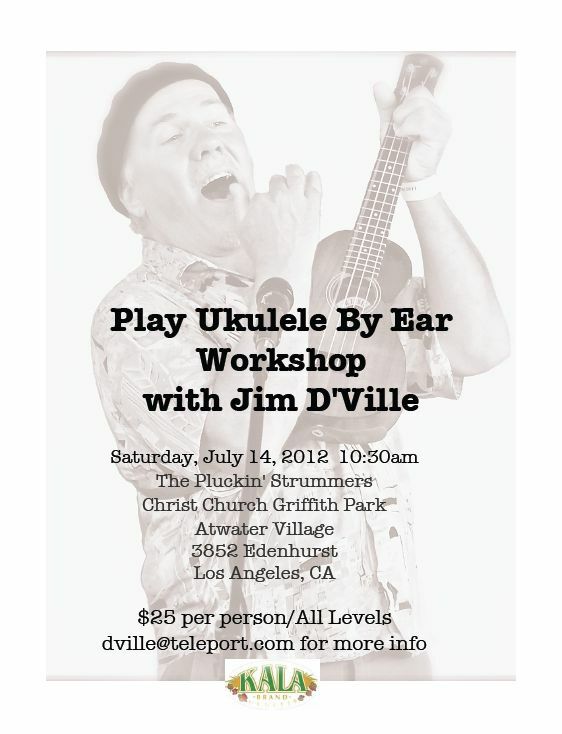 He has taught his Play Ukulele By Ear workshops to thousands of players in the United States, Canada and Australia. Jim is the author of the Play Ukulele By Ear DVD series and hosts the popular Play Ukulele By Ear website (http://www.playukulelebyear.com). His approach to teaching ukulele has been featured on Oregon Public Broadcasting’s Oregon Art Beat and he is a regular contributor to James Hill’s e-magazine Ukulele, Yes! Jim is sponsored in-part by Kala Ukulele and National Reso-phonic. We’re looking forward to seeing you all on the 14th!